Shout! Factory Kids and Nick Jr. have teamed up to release another collection of episodes from the network’s hit series Kuu Kuu Harajuku next month that is certain to entertain the series’ key audiences. The companies, along with dhx media, Red Flags Fly, Film Victoria, Moody Street Kids and Vision Animation, will release the series’ latest DVD Super Kawaii on Sept. 26 in stores and online. The DVD, whose run time just tops the two-hour mark, offers plenty of entertainment for its target audiences in part because of its episodes. This will be discussed shortly. The stories presented in each episode are collectively just as important to discuss in examining this new DVD as the episodes themselves. It will be touched on later. The disc’s bonus material rounds out its most important elements, and will also be discussed later. Each element noted here is important in its own way to the DVD’s overall presentation. All things considered, they make Super Kawaii another “super” collection for any young Kuu Kuu Harajuku fan. Shout! 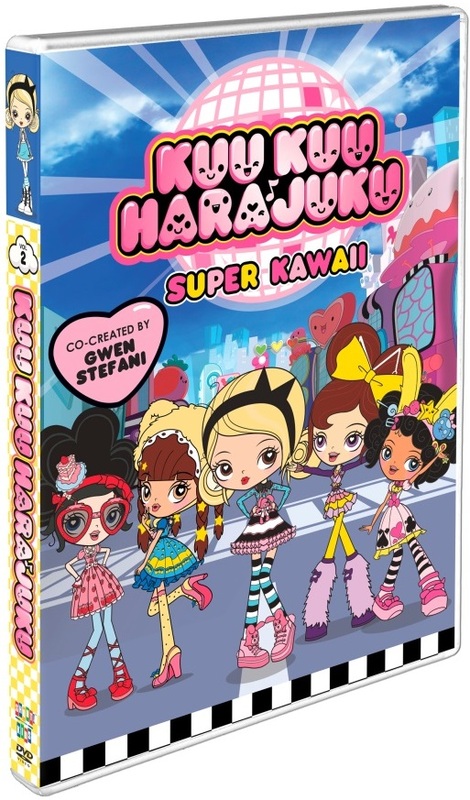 Factory Kids’ new Kuu Kuu Harajuku DVD Super Kawaii is another “super” collection for any of the series’ young fans. That is due in part to the episodes presented in this latest collection. The collection’s 12 total episodes are all culled from the series’ first season rather than being pulled randomly from each of the series’ two current seasons. Even more interesting to note is that they are presented here in exactly the same chronological order as they were presented in their original airing on Nick Jr. The episodes’ ordering and the fact that they are all pulled from the same season is important to note because of how often companies out there release compilation DVDs whose episodes seem to be randomly pulled from their respective series. Every company does and has done this. Considering this, the episodes and their precise ordering create a solid foundation for the DVD’s presentation. The foundation formed through the episodes and their ordering allows the stories presented within the episodes to sit easily atop them. The stories that are presented within the DVD’s featured episodes are key to discuss in examining this DVD because of the variety in the stories. The majority of the stories presented here center on HJ5 going on various adventures linked to them performing while facing just as many varied situations. “Music Zoo” for instance finds the girls having to help clear Music’s reputation and record so that they can perform at their local zoo. “Delectabubbles” finds the girls of HJ5 having to escape from an evil queen who wants to keep them in a bubble to silence them once and for all. “Life is But A Dream” puts the ladies into one collective dream and leads to an interesting outcome for another concert. Of course not every one of the stories shown here centers on the girls’ concerts. Others are random adventures such as “Control + Alt + Dimension,” which uses a classic alternate universe story line for its setting. Of course in this story, one of the girls ends up in an alternate universe in which everything is opposite of her universe. HJ5 is evil while General NoFun and his sidekick Commander Boring are the good guys. The story follows Music as she tries to get back to her own universe, having to use the good Gen. NoFun and Cmdr. Boring to help her. As if all of this is not enough, there is even an episode that takes a stab at record labels and their tactics in another of the set’s stories. Between all of these stories and others not noted here, it becomes clear in examining the stories why they are so important to this DVD’s overall presentation. They show the writers’ abilities to keep things fresh from one episode to the next even when using one central plot line for the stories. On a side note, anyone that is or has been a fan of Hanna-Barbera’s classic animated series Josie & The Pussycats will especially find these stories entertaining as they clearly show that series’ influence from one to the next. When this is considered along with everything else noted here, it becomes even more clear why these stories are critical to the DVD’s overall presentation. They are stories that will entertain older audiences just as much as younger viewers who might not be so familiar with the series’ obvious influence. Now keeping everything already discussed in mind, the episodes and their stories are only a portion of what needs to be discussed in examining this DVD’s overall presentation. Its bonus material is just as important to discuss as those aforementioned items. The bonus material included in the DVD introduces the voices behind the girls of HJ5, and is actually interesting in its own right. The young ladies who bring the girls to life talk about the importance of the group being presented as strong, confident characters and about the characters themselves among other topics. Those other topics include how the cast came together, how the characters’ personalities were created and more. The featurette runs roughly 20 minutes or so, and not a moment is wasted. The whole run time is filled with information that expertly introduces young audiences to the show on another level. That breadth of information presented in the bonus featurette strengthens the DVD’s presentation even more, showing even more why this DVD will keep the series’ target audiences entertained with each watch.